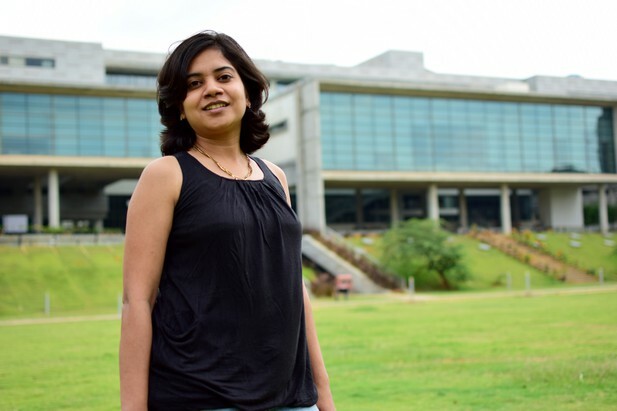 Tarjani Agrawal is currently completing her PhD in neurogenetics at the National Centre for Biological Sciences, India (NCBS). After her PhD, she would like to move abroad and continue working in research as a postdoctoral fellow. Tarjani Agrawal in the NCBS grounds. Image credit: Sudipta Ashe. Fruit flies are like tiny flying robots. They beat their wings one hundred times a second and can change direction in just a few milliseconds. However, we don’t know which neurons in the brain co-ordinate with the muscles used to fly. I try to explain flight as a well co-ordinated motor behaviour like walking, swimming and running. I am looking for the neural circuits that keep flies airborne. What attracted you to studying neural circuits in fruit flies? While flying, fruit flies rely on information from multiple senses, including smells and sights. To me, using genetics as a tool to find and study the neural circuitry for flight in fruit flies is like connecting the pieces of a puzzle. Every piece of information that we get gives us a hint about the next piece, which could be just one piece amongst thousands, but will have a unique structure and role. And the outcomes always make us more curious. Calcium ions are used to send signals in many biological processes, especially in neurons. It has been debated whether dFz2, which is a receptor protein present on the outer membrane of neurons, acts via calcium signalling. Our study shows that it does (Agrawal and Hasan, 2015). This signalling regulates flight by making an enzyme called tyrosine hydroxylase in dopaminergic neurons. Going a step further, we found that PAM dopaminergic neurons, which form a cluster of about 120 neurons towards the back of the brain, stimulate a brain region called the mushroom body. The activity of this circuitry is essential for the maintenance of flight. The mushroom body has always been studied in the context of olfactory memory formation and reinforcement—the ability to remember and respond to odours. Our study shows that it is also involved in the regulation of a well co-ordinated motor behaviour: the flight of fruit flies. This changes the perception of the mushroom body in the field—now it can be thought of as a junction for various processes, including olfactory memory formation, visual learning and mating, as well as motor behaviour. I previously found that a receptor protein called PdfR, which is a regulator of circadian rhythms in flies, also regulates flight (Agrawal et al., Plos Genetics 2013). Currently, I am investigating whether there are any common roles of PdfR in circadian rhythms and flight. I am using different light conditions to either disrupt or maintain circadian rhythms and then testing how this affects the ability of the flies to fly. It would be that Sunday when I saw that an increased amount of tyrosine hydroxylase in the PAM neurons of dFz2 deficient flies is sufficient for flight. I got goosebumps seeing those flies flying for longer time periods. The worst day would be when I was trying to do multiple experiments in one day ranging from western blotting, flight assays, dissections and confocal imaging. By the end of the day none of these experiments had given any conclusive results. It was then that I decided that I would plan only one type of experiment for each day. My PhD guide Gaiti Hasan has inspired me in multiple ways. Her thinking and ideas have influenced my scientific approach and made me the researcher that I am today. I have learnt a lot from her, especially how being proactive helps in doing good science. There is lot of competition in the field of science, which sometimes leads to criticism as well. What I think would really help is more constructive criticism. This can push someone to perform better. What would most improve the professional lives of early career scientists? The only advice I have is ‘Be positive and keep going’. This mantra has influenced my life tremendously and encourages me to do better at every step. If you are curious and love science then the sky is the limit. While performing experiments in the lab, you will have exciting moments as well as really dark times but the only thing that helps is being interested. So, do something that you would really like to do. What is India like for science? I would say India is a great place to do basic learning, as technology is not used as much during early education, which leads to a lot of learning by trying new activities and practising them. However, for higher and more sophisticated scientific research demanding complicated tools and techniques, India is still developing facilities and building infrastructures that will make it a better place for science in future. Why would you like to go abroad for a postdoctoral position? I feel that knowing and collaborating with different scientists all across the world is very beneficial. Doing my postdoctoral work abroad would give me a better opportunity to interact and discuss my work with many more scientists. It would also allow me to learn personally from the experts in the field and explore challenging and interesting problems. I try to engage myself in lots of activities outside the lab. Some of my favourites are travelling, playing board games like checkers and monopoly, and sports like badminton and squash. However, listening to music while swimming tops my list. Mostly not. I try to catch up with friends and family from time to time. I should mention that this is something that I have learnt from my PhD supervisor. I would like to be an independent scientist with a dedicated lab space studying how multiple behaviours are integrated and the influence one behaviour has over another. Social behaviour among fish has always amazed me. I wanted to explore size-based hierarchal organisation among clownfish. After joining NCBS, I learnt that studying fruit flies is much easier, thanks to all the genetics. However, I still maintain a bowl of two blackmoor goldfish and a few guppies in my house. While my eLife paper was in review, I was on leave to get married to a non-scientist. He is an engineer by education, and he always gives me a different perspective of my own work. He is a financial analyst, working in New York for an investment bank. He deals with huge data sets analysis and advises me on how I can handle highly variable huge datasets. If you could commission eLife to interview a scientist who you want other early career researchers to be inspired by, who would you nominate and why? I would definitely nominate Prof. K. VijayRaghavan, Secretary of Department of Biotechnology, Govt of India and former director of National Centre for Biological Sciences, Tata Institute of Fundamental Research, Bangalore to be interviewed. He holds a lab at NCBS exploring the neural circuitry and developmental program for the walking behaviour of fruit flies. He is a wonderful scientist and has a dynamic personality. Every discussion with him—either scientific or non-scientific—leaves you with a wonderful feeling of positivity and hope. I still remember the discussions I had with him during initial years of my career and they are still inspiring. Despite being extremely occupied and busy in his schedule, he was always available for discussion and would later remember every detail about it. I am certain anyone who has met him or known him cannot be left uninspired by his achievements and personality.